Three mourners sat before the shaman as she placed her hand over each one’s heart in turn, pounded on their upper backs, blew air onto the crown of each head, and draped a cloth dipped in sacred water over their shoulders, all the while chanting a story of consolation. They were the ones who had discovered the body of their drowned colleague and friend, and who now sat before the presiding shaman, Suh Sun Sil, at the funeral ritual. Suh, in a rite universal to all such traditions across the globe according to philosopher and shamanism expert Mircea Eliade, was helping them to retrieve the part of their souls that had been lost as a result of their shocking experience. 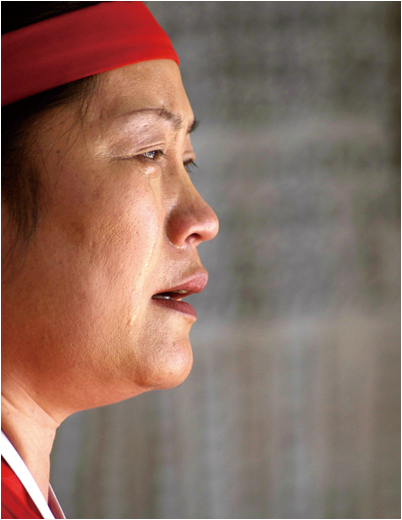 Earlier that day, words of consolation from the deceased woman to her colleagues, her haenyeo (female diver) sisters, poured from the mouth of Suh as she became a conduit between the living and the dead. In the early evening, Suh and three other shamans would accompany the husband and haenyeo sister-in-law of the deceased to the nearby shore where her body had been recovered, in order to call her spirit from its watery grave and give offerings to the Dragon King and water spirits in return. Photo 1. 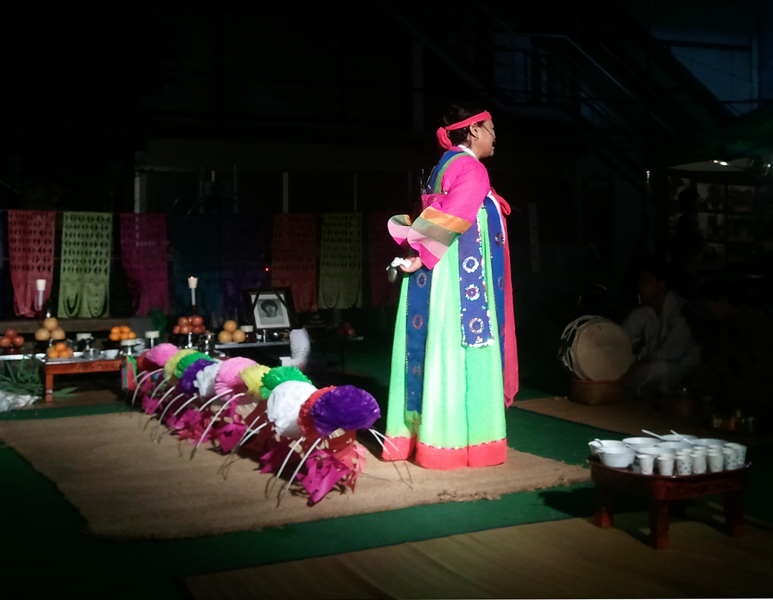 Shaman Suh Sun Sil performing memorial ritual for ‘Keun-Simbang’ (Grand Shaman) Lee Jung Chun. Photo by Hong Sunyoung. 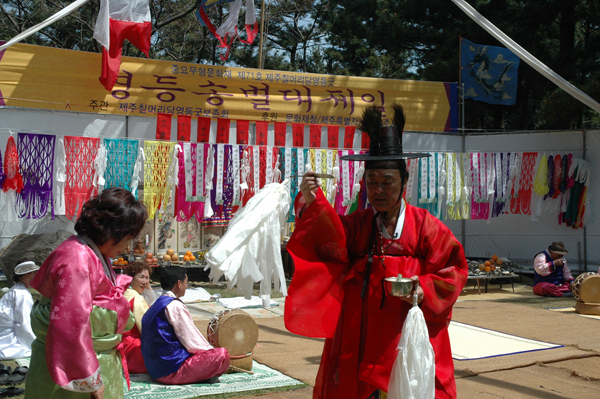 On the second of the two-day ritual, Suh simbang (shaman, in Jeju dialect) would provide an elaborate rite to console the spirit of the dead woman and, in the role of psychopomp, usher her to the Otherworld. In addition to soul loss and retrieval, universal themes of shamanic traditions according to Eliade include altered states of consciousness, travel by the shaman and spirits between material and immaterial planes, ecstatic states, delineated ritual space, sacred center and conduit and the concept of a quest, among others. Four cross-cultural healing techniques of the shaman include the deliberate use of singing, dancing, storytelling, and silence, according to cultural anthropologist Angeles Arrien. Scholar Malindoma Some, in his 1997 book, “Ritual: Power, Healing and Community,” described the shamanic rites of his Dakara tribe in Burkina Faso as an opportunity each time for the healing of all members, not limited to those directly affected. After ensuring her clients’ initial comfort, Lee then assesses through the use of divination whether the client’s circumstances can be effectively addressed through ritual or require medical or other intervention. She prefers seeing clients in their own homes if possible; otherwise, she meets them at the seashore. Lee’s husband Kim Yoon Su, one of only two remaining keun simbang (grand shaman) on Jeju, expressed his concern in conversation last May over the lack of intergenerational transmission of Jeju shamanism. Fearing that modernization might soon bring an end to this practice, he allowed that he has no immediate successor as his own children did not follow in the family profession, unlike the generations before them. Photo 2. Shamans Kim Yoon Su and Lee Yong Ok in ritual. Photo provided by Chilmeoridang Yeongdeung-gut Preservation Society. Rhi Bou Yong, neuropsychiatrist and Jungian psychologist, wrote his doctoral thesis on “Shamanism and the Korean Psyche” in the late 1960s at the C.G. Jung Institute in Zurich. Now retired from Seoul National University and currently the founding director of the Korean Association of Jungian Analysts in Seoul, he has published numerous related articles. 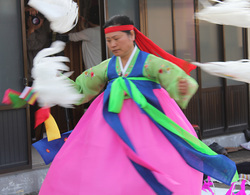 In our conversations in 2005 and 2006 as well as email communication of last year, Dr. Rhi repeatedly emphasized the importance of Korea’s shamanic tradition in defining as well as treating the collective Korean psyche. Shaman Kim Keum Hwa agrees. A mainland shaman of North Korean heritage who bears the nationally designated title Important Intangible Cultural Asset No. 82, she holds an honorary doctoral degree and is considered a national treasure. Kim traveled to Jeju in early October of this year to perform a public ritual with the well-known contemporary dancer, Hong Sincha, for the good of Jeju Island and its people. The scientific foundation of indigenous psychology has been well established by scholars Kim Uichol and Park Young-Shin (Inha University, Incheon), among many others. Koreans’ innate psychology has been explored in detail by Seoul scholars Choi Sang-Chin (Chung-Ang University) and Kim Kibum (Sungkyunkwan University), in particular the phenomenon of “cheong” or “shimcheong” [sic] which might be described as a feeling of close relationship that includes shared meaning in a context of community, and which is supported by the shamanic ritual. Other examples of mental-emotional constructs within Korean culture include han, nunchi, and kibun, among others, all used to describe aspects of the Korean psyche which are not easily translatable into English nor precisely duplicated elsewhere. The American Psychiatric Association’s manual on mental disorders, DSM-IV, includes a section on “culture-bound syndromes” – a constellation of mental-emotional symptoms which are only found in a particular culture and are most successfully addressed within that cultural milieu. It includes two from Korea: hwa-byeong and sin-byeong, the latter of which is experienced by those being called by the spirit world to become shamans. Shamanism, in modern as well as historical eras, provides many of the same functions for Jeju society as does psychological counseling. Its form is flexible and adaptable, integrating modern elements as needed in order to maintain its relevance. Shaman Lee Yong Ok, of the Chilmeoridang shamanic society, presided over an unusual memorial ritual earlier this month. In remembrance of Yang Yong Chan, a student activist who became a martyr by self-immolation 20 years ago, the ritual was held in a park in Seogwipo along with other activities of remembrance and the dedication of a memorial stone. Considering the circumstances of his death, the Chilmeoridang shamans combined two rituals in a new form likely never before performed in quite this way. Integrated were elements of both the traditional funeral ritual and the rites to the fire gods normally performed when a house has burned down – to ensure the safety of rebuilding on the site. Photo 3. Shaman Lee Yong Ok conducting memorial ritual for Yang Yong Chan. Photo by Anne Hilty. In a moving display, the ritual had been constructed according to need, indicating the tradition’s flexibility and ability to continue to comfort and address the needs of a modern society. In April of this year, the Jeju 4.3 Peace Foundation sponsored a national conference entitled, “4.3 Trauma, Seeking Healing.” In addition to specialists in the areas of history, psychiatry, and psychology, Jeju culture expert Moon Moo-Byung and Seoul scholar of religious studies Kim Seong-nae (Sogang University) spoke on the use of shamanic ritual for healing. Kim, who has published considerably on Jeju shamanism, refers not only to its healing capabilities but also its role in determining the collective narrative, or cultural identity, thereby relating it to psychology in yet another way. “…the shamanic epics and legends articulate the rhetoric about…the identity of Cheju [sic] people as tragic heroes and ‘frontier exiles,’” Kim has written. The renowned Swiss psychiatrist and father of analytical psychology, Carl G. Jung, wrote extensively in the early 20th century on the parallels between shamanic practices and psychoanalysis, in particular regarding his theories on archetypes and collective unconscious and the role of the psychologist as a skilled facilitator of same. His contemporary, accomplished mythologist and prolific author Joseph Campbell, also explored such parallels in detail. Photo 4. Shaman Suh Sun Sil in repose during ritual. Photo by Brenda Paik Sunoo, author of “Moon Tides”. Shaman Suh Sun Sil recounted, in an interview earlier this month, the story of a schizophrenic man brought to her for consultation. Referring to his “fragmented spirit” and marginally successful prior medical treatment, she described her use of ritual to bring “comfort to his mind” in what might be termed “reintegration” by a psychologist. Following the ritual, he continued his medical protocol with greater success. Shaman Suh also told of her use of dance and song to alleviate clients’ depression, ritual for the transformation of ‘han’ which is a constellation of suppressed emotions including resentment and unresolved grief and loss among others, rites for alleviating the delirium tremens and hallucinations of alcohol detoxification, and the facilitation of broken relationships “by repairing the spirit.” Citing the power of words and her need to choose them carefully when designing and conducting rituals, Suh also identified the loss of ritual in modern society and the increase in stress and stress-related illnesses as a result. Michael Winkelman (Arizona State University, USA) is considered one of the foremost scholars on shamanism today. Referring to shamanic practice as “neurotheology and evolutionary psychology” in his 2002 article in American Behavioral Scientist, he identified the psychophysiological effects of altered states of consciousness, neurotransmitter responses resulting from the combination of ritual and community, and the relationship of concepts regarding “spirit” to those of individual and group psychodynamics. Shaman Lee relayed in a recent interview the 40 year-old story of a Jeju physician with chronic migraines who, after all treatment failed, was scheduled for brain surgery in Seoul. Prior to surgery, he consulted Jeju shaman Moon Ok Sun, who was the mother of Kim Yoon Su, keun simbang (grand shaman) and leader of the Chilmeoridang shaman society – and Lee’s husband. During the ritual, Shaman Moon discovered that the physician’s brother had been executed during the 1948 turmoil on Jeju and mourning rituals were never performed because they were forbidden at that time. Shaman Moon performed rituals to comfort the dead and the living, and the physician’s migraines were resolved without surgery. Later, in his clinical practice, he was known for referring treatment-resistant cases to the shamans for ritual. The shaman, like the psychologist, pursues an extensive period of formalized training, often in the form of apprenticeship to a senior practitioner and internship under supervision. The concept of “wounded healer,” referring to the shaman – or psychologist – who can deeply empathize as a result of his or her own earlier experience with pain, is common to both professions. All shamanic ritual follows a standard format. Beginning with a clearly delineated purpose and rites of preparation and purification, the facilitating and supporting shamans shift their consciousness to that of a trance state, invoke the spirits, and request their beneficence. The main task is then addressed in a variety of rites, participants or clients express their gratitude by making offerings, the spirits are then dismissed, and the ritual brought to closure. Ultimately, the boundaries of the sacred space are opened once more, the ritual bond between shamans and participants is released, and all return to their everyday lives. The counseling session between psychologist and client follows a near-identical basic pattern. Sharing features with such traditions throughout the world’s cultures, Jeju shamanism provides comfort to a number of the island’s native people. While the shamanic rites are not offered as frequently today as they were 50 years ago, according to shamans Kim, Lee, and Suh, the practice of shamanism remains a vital element in the health of Jeju society, worthy of preservation.